[miau] With different mobile devices out on the market today like the iPhone, different types of tablets, and even people using the Internet from their gaming consoles, a lot of gamblers are looking for a different type of functionality with their online games. For instance, games today need to look impressive and run smoothly on a range of mobile devices, and this is where the Wolf Run slots game earns points off the bat. As a game that was designed to be mobile, this IGT release runs smoothly, cleanly and looks great on smaller smartphones and tablets. At the end of the day, how a game plays isn’t nearly as important as the actual gameplay features, however. So, in terms of providing user-friendly features that gamblers will love, how does Wolf Run actually stack up? The first thing we need to look at is the game’s theme. There’s nothing too fancy here; just a basic Native American influenced wolf-themed game that howls at the moon, brings some good graphics to the table, and that offers up some cool bonus features. Wolf Run isn’t anything that’s going to win awards for the best slot game available. However, it does offer up a lot more than your average machine. For starters, this is a 5-reel machine that actually has a very impressive 40 playable paylines. The symbols of the game pop off the screen, and include white and black wolves, classic Native American fair, playing card symbols, and more. Although there isn’t a standalone bonus game to speak of with Wolf Run, there are some bonus features that might impress some slots players. For instance, if you hit 3 scatter symbols (the Bonus symbol), you can win 2x the total bet and also scatter the lines and win again. You can also hit a multiplier, different wilds, and other features like the free spins. Although you only receive 5 free spins, they can be retriggered at any time. 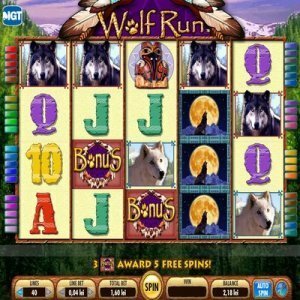 Wolf Run has a large jackpot and a 95% payout percentage, so this is a game that’s going to give you some good wins while playing. It also has a wide variety of betting options, so no matter your particular stakes level, you should feel comfortable playing here. You can bet as little as a buck all the way up to 300 per spin. If one were to judge Wolf Run by the other modern age online slot machines, then the graphics might appear to fall short. However, in terms of a strict mobile game, the symbols seem to pop and stand out well. When it comes to bonus features, the game is in definite need of a legitimate bonus round, but there are a lot of wins here, and the free spins feature is nice.